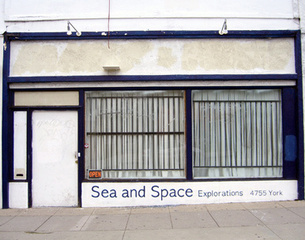 Sea and Space is a not-for-profit artist run gallery founded in June 2007. All artists and staff who work here do so during their free time, making this space possible through their contribution of time and money for the sake of presenting challenging contemporary art. We operate on an alternate model to commercial art spaces with no disrespect to these entities. Our goal is to foster, through appreciation and support, artistic practices that are dependent upon alternate means for visibility. Lara Bank is the only full-time staff member. We will be adding a six-month guest curator residency position starting in September 2009. We have a very supportive board of five who are essential to the preservation of this space. call 323-982-0854 or email to make an appointment. The sea and space bracket us, literally and metaphorically. Familiar and unfamiliar, easy to see but impossible to fathom, they inspire the poetic and the empirical. Sea and Space Explorations is a portal to a place where notions of good and bad, market constraints, and fixations with progress are understood to be peripheral, where artists take risks without fear. This space hosts artists whose practices resonate with the conceptual, theoretical, relational, and political. The space costs $900 a month to operate. This includes rent, electric, postage, and cleaning supplies. Sales of artwork are split 50/50 with the gallery (suggested donation). The gallery typically only sells about $200 of work a year. The main objective of the space is not to sell artwork. Yearly fundraisers: Holiday benefit earns $800-$1500 yearly. All proceeds last year went to our non-profit application. The year before we fixed our electric to bring it up to code. Performances: we will be charging a $3-$5 suggested donation for upcoming performances. Exhibitions and lectures remain free. Operations: curator, artist/curator selections, studio visits, website maintenance, promotion, press contact, documentation, repairs and maintenance, accounting, cleaning, gallery sitting, and primary funder. February 2008 - May 2008 Chelsea Lewcow. From Occidental College. Sea and Space misses you Chelsea! •Your dates given include de-installation and installation. Please keep this in mind when scheduling with us at your initial scheduling appointment. We cannot scramble dates at a future time and alter other artists show times. •Installation and deinstallation of show. •The space should be returned to the state that you found it in. Artists are responsible for repairing the walls, floor, ceiling if they are altered or marked. If alterations are extensive, cost for repairs will be the artists responsibility. •Publicity: email marketing to public and press releases to press. •Paint and painting supplies to return space to original state. •BBQ out back is free to use and back patio area (as long as noise is kept to a minimum, we do have lovely neighbors). Mugs are $3 to buy and free to borrow. All proceeds go to the gallery. 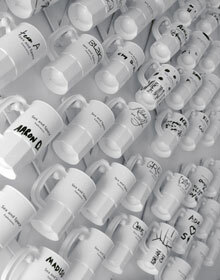 Bought mugs can be taken or left in the gallery with your name (mark) on your mug.